Yes, it’s a great lost space! I’m glad to hear you like the plan. The best part is the shelves are interchangeable. It’s simple to make but let me know if you have any questions! What a great idea! 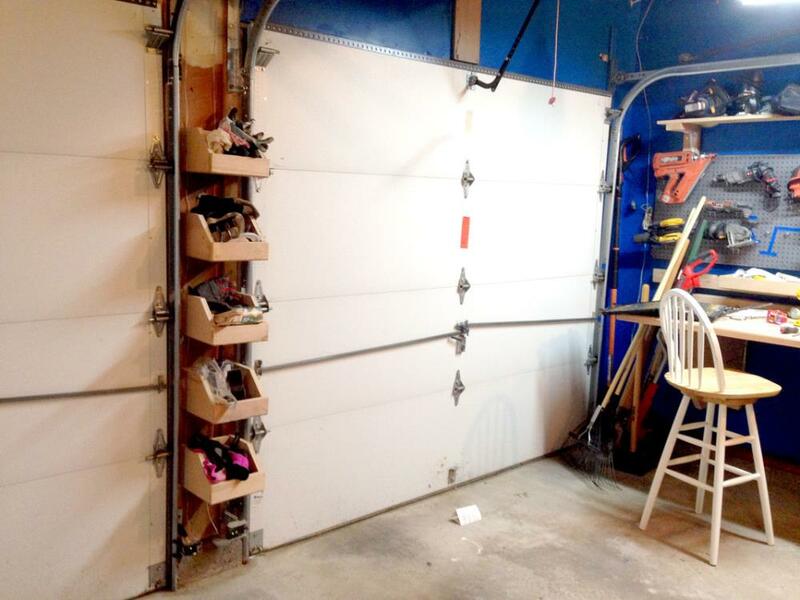 In between your garage doors is a great place for storage. Thanks Casserole Gals!! 🙂 Its super helpful! These are such clever ideas! 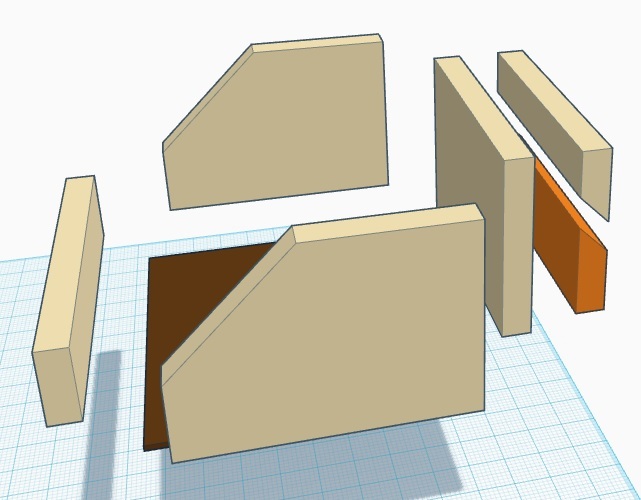 Love that the first set of shelves/boxes are so versatile and modular. And that charging station is incredible. It makes me wish we had a real garage. Thanks so much for sharing at the #happynowlinkup! Love the way you redeemed those little spaces. Just last night my husband and son built some shelves in our cellar stairway, making use of some wasted space! What a gift! Thanks, Michele!! Basement shelves are a great idea!! 🙂 I’ll have to remember that :)) Happy New Year! I LOVE scrapwood projects – thanks for sharing! Very clever! What a great way to use otherwise wasted space! Thanks, Barrie!! Ash thinks of the best ideas:) I would have thrown it out 🙂 Happy New Year! Ash and Eileen, this is brilliant! I followed your link from Saucy Saturdays expecting something else entirely. “Storage” tips, like “organizing” tips, usually involve containerizing stuff nobody needs to keep anyway! But your between-door boxes (first I’ve ever heard of French cleats!) 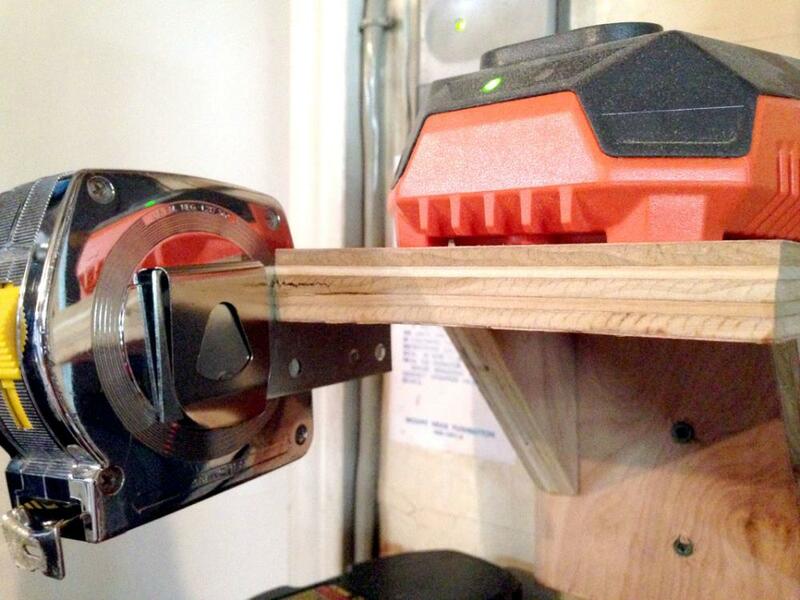 and your tool charging station are perfectly practical and things of beauty! Thank you so much, Jean! Ahh perhaps I should change the title 🙂 I first heard of French cleats with Ash too – he LOVES them, and they are pretty awesome!! Happy New Year! That’s a great idea! We have a small wall- mounted shop vac that sits in between our two garage doors. I think we’ve just about used our wall space to it’s max! Great idea and perfect instructions!! Thanks for sharing on the DIY link party! Thanks so much, Helen! Happy New Year to you! what a genius idea! 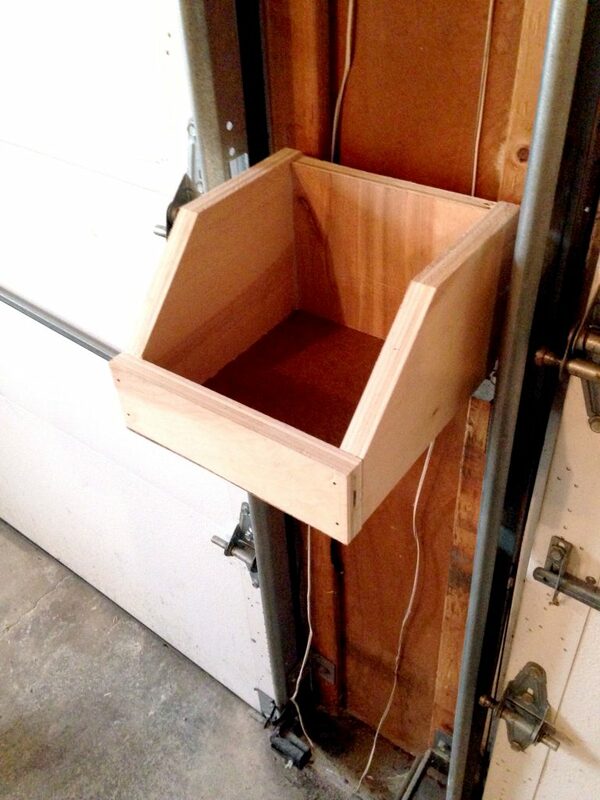 I love extra storage, and scrap wood projects are my fave. Thanks for linking up to Funtastic Friday! Great storage tips. Thank you for sharing with Vintage Charm. Thanks, Sharon :)) Thanks for hosting, too! Way to utilize all the space you can. My husband wishes for a garage. All he has is a small shed. Which I think he should organize. Absolutely brilliant! Definitely applying some of the ideas here to my garage. That’s a great way to take advantage of small unused paces. The shelves are nice, but I love the boxes, there’s so much storage space there. Thank you for joining The Really Crafty Link Party this week,. Pinned! Will be showing hubby these ideas, awesome. Found you on Party in Your PJ’s Link Party. Very clever and efficient use of space. I am impressed. Those boxes are a great idea! I’m going to have my kids make them, looks like a useful project and will hold their gardening gloves and tennis balls! Thanks Carissa! So glad you liked them!! These little shelves and boxes are a great idea. 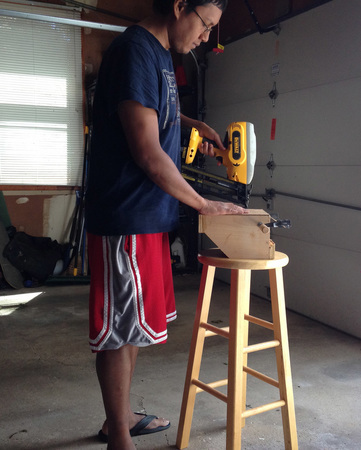 Thanks for the advice on the 18 vs. 16 gauge nail gun, too. 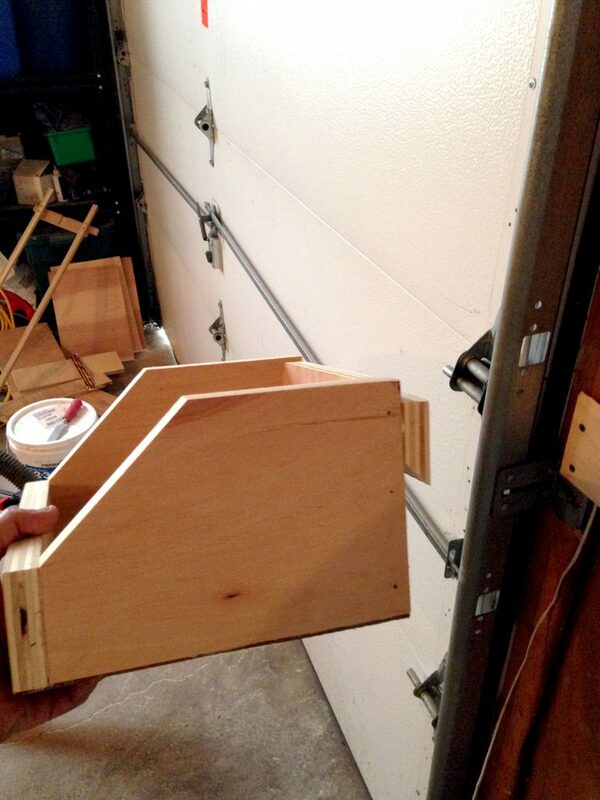 Great ideas…wish I had a garage to implement them. Thanks Barbara! Maybe you could incorporate some of the ideas into a basement? We have some great purchased storage items in our garage. This is a great DIY! Thanks for sharing with SYC. Clever idea in using up unused space in my ‘she’ shed. 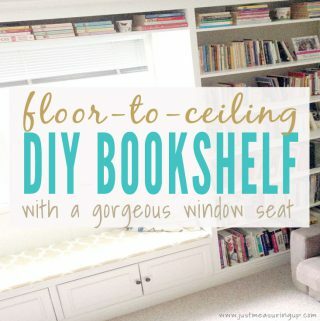 WOW what a fantastic idea to use that little nook of space!! I am totally pinning this idea……Oh honey! HA Now I just need to find my own little spot for something like that since we don’t have a garage. Thanks so much for the idea! Thanks Kathleen! Even though Ash is messy, he lovvves storage haha! I love this idea! You can never have enough storage space! 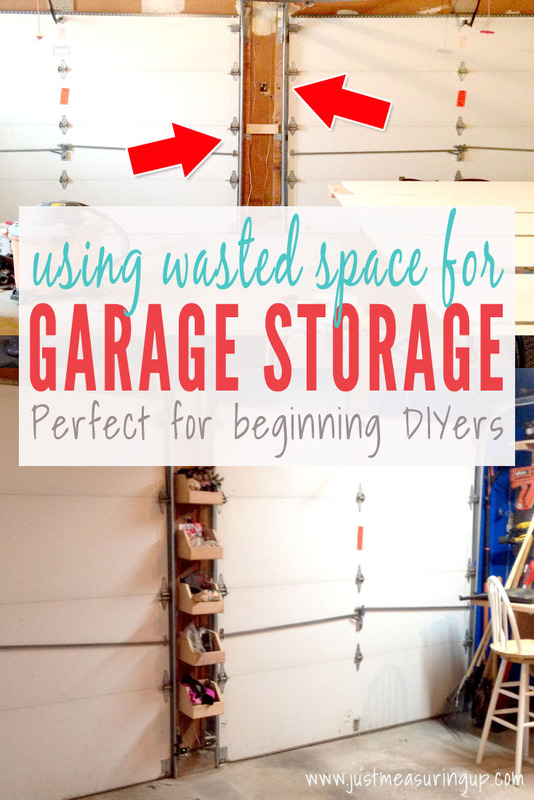 It’s always nice to have extra storage space and especially in the garage! Thanks Natalie! I agree! We have filled up every corner of our house – so the more storage the better! 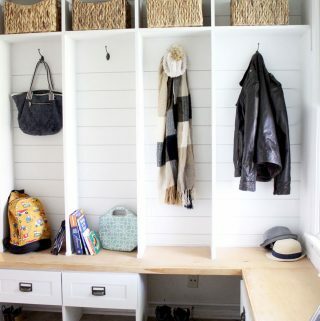 These are genius, space saving ideas! Thanks for sharing this with us at #TriumphantTales. I hope to see you back next week! 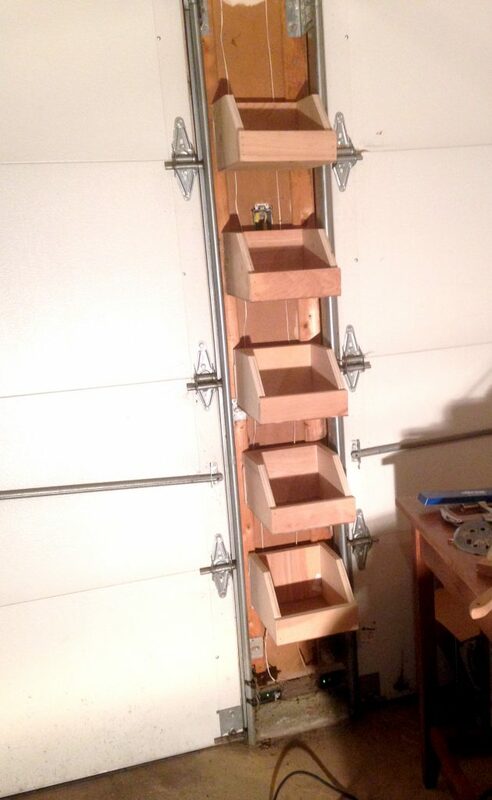 That really is an amazing use of space, and your storage unit looks good too! Thank you so much for sharing this great tutorial with us at the Hearth and Soul Link Party. Hope to ‘see’ you again this week! Love your ideas, my husband and I are always making good use of space for storage! Thank you for sharing your post on the Simple Homestead Hop, as one of the co-hosts I will be featuring your post this week! What a brilliant use of otherwise wasted space. 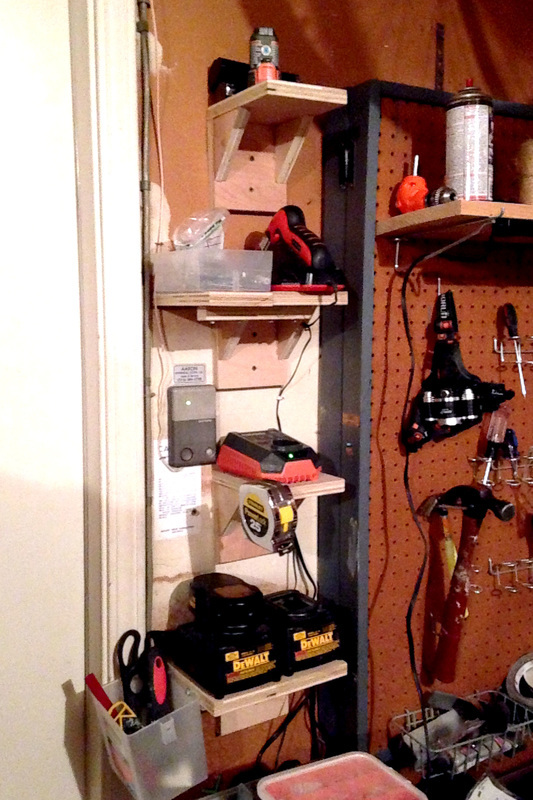 You can never have too much organizing in the garage. Congrats, you’re featured at the This Is How We Roll Link Party. Just found your site. I love these space savers ideas. Nicely done. I’ve completed a bunch of long standing projects lately and their aftermath has left me with the conclusion that it is time to really knuckle down and get the shop organized. So I have put everything on hold while I make some much needed organizational improvements to my work space. I have come to a few conclusions that I am using to guide me process. 1. If I use it a lot, I need to make it easy to get to and easy to put away. This may sound obvious, but I find that things like my angle grinder, which I typically keep in the factory case on a shelf above my workbench, is seemingly easy to get too but once I get it out the case and all the discs are left sitting on some horizontal surface, usually my work bench, taking up valuable work space until I am done with my project. I’m going to ditch the case and try to locate it and all it’s related accessories in a drawer or tool box so as to eliminate the wasted space a case takes up while not in storage. 2. Vertical storage is the only effective way to keep your benches clear. This one I think is key. Stacking things on flat surfaces is a waste of work space and invites the addition of more crap. It also makes it harder to get at things. 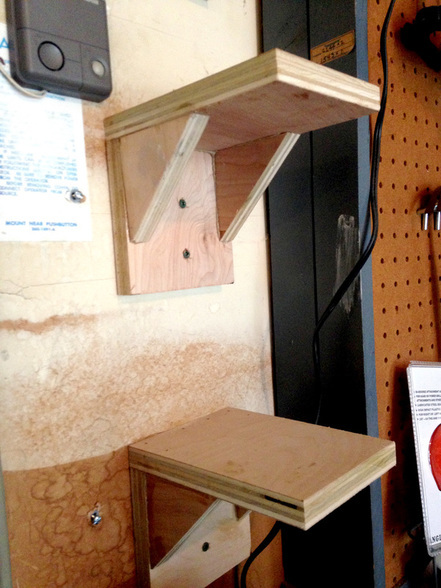 Ideally things should be stored on a wall or shelf 1 item deep and 1 item tall. If you have to stack things, you need more shelves. 3. Organize like things together. This one also sounds obvious, but things like boxes of bolts, screws and nails seem to get strewn around my work benches to no end. I have tackled this by buying one of the Harbor Freight rolling hardware carts. It has a ton of space to store loose hardware of all kinds and since it’s mobile, I can roll it right next to the project I am working on saving trips too and from the workbench. I have also bought some cheap tool boxes to store things like electrical parts and pieces. I have one box devoted to things like breakers, wire crimps, switches, cable ends, plugs, etc. I have done the same for plumbing parts and fittings. 4. 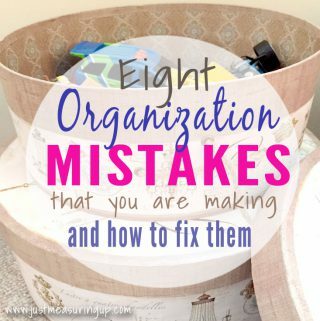 When you’re finished with a project take some time to clean up and put stuff back where it belongs. We’d all rather be wrenching, but it is important to take a short break after any project and simply clean up. I have been lax in this and it has shown. Before I started cleaning, I had 3 benches full of crap now only 2 are full of crap and I hope to have that down to 1 before the end of the week.